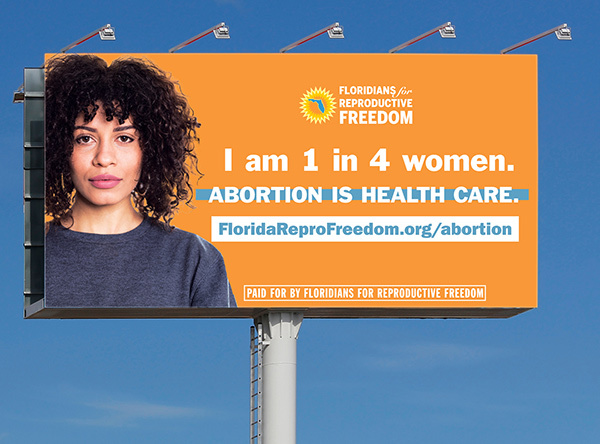 Floridians for Reproductive Freedom billboards will appear all over Tallahassee during session in 2019. Advertising comes as Republicans propose new abortion restrictions. Twenty-four pro-choice billboards now stand in the way of lawmakers and their Tallahassee offices. It’s part of a campaign by the Floridians for Reproductive Freedom coalition in advance of this year’s Legislative Session. The billboards will be concentrated on the major roads leading into Tallahassee, with more on Interstate 10, Interstate 75 and Florida’s Turnpike. “Our goals are to support the one in four women who have had, or will have an abortion in this country, and remind leaders in our state that abortion care is health care,” said Charo Valero, state policy director of the National Latina Institute for Reproductive Health. The English and Spanish-language billboards are part of coordinated messaging that also includes online advertising, college campus promotions and a social media blitz. There will also be a mobile billboard at the Capitol. The push comes while pro-life lawmakers make a push for new legislation in Florida. The coalition singled out legislation filed by state Sen. Joe Gruters, a Sarasota Republican, that would outlaw abortion at 20 weeks. More threatening, the coalition notes, would be a “fetal heartbeat” bill sponsored by state Rep. Mike Hill, a Pensacola Republican. That could make abortions illegal at six weeks, before many woman even know they are pregnant. “These bills are rooted in opposition to safe and legal abortion – not credible medical evidence,” said Laura Goodhue, executive director of the Florida Alliance of Planned Parenthood Affiliates. But the fact Gov. Ron DeSantis just named three new justices to the Florida Supreme Court has generated hope for a court challenge, as noted by right-leaning blog The Capitolist. It’s operated by Brian Burgess, one of the first spokesmen for then-Gov. Rick Scott. But that in turn has pro-choice lawmakers reminding lawmakers that the state’s female electorate still wants control over their own bodies. Valero said allowing women to maintain agency over their own reproductive rights must be remembered by lawmakers. Those words will appear on a number of the billboards, alongside pictures of women alone or in family groups. Others show a young Hispanic woman alongside the statistic that one in four women will experience an abortion at some point in their lives. “Floridians aren’t truly free if we can’t make our own decisions about our bodies, our lives, and our futures,” said Gina Cremont, a campaign spokeswoman. She lists herself as one of those women who have had an abortion. “When someone decides to have an abortion, it should be safe, affordable, and free from punishment or judgment,” she said.